This list provides an overview of books concerned with topics in chamber music. 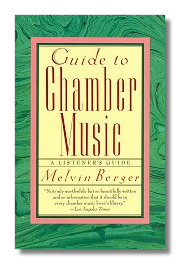 Guide to Chamber Music. Melvin Berger. Anchor Books. 1990. ISBN 0385411499 (hardcover). This comprehensive, analytical, and historical guide is designed to help music lovers – from casual listeners to experienced concertgoer – deepen their understanding and enhance their enjoyment of chamber music. Chamber Music: Research and Information Guidelines. John H. Baron. Routledge (formerly Garland Press). 1987. ISBN 0824083466 (hardcover). Volume 704 from the Garland Reference Library of the humanities. Lists music from two to twelve players. Only lists piano if it is found with other instruments (no piano ensembles listed). The same holds true for percussion instruments. Refers to books, articles, journals, theses and biographies. Includes basic reference sources, a history of chamber music with special sections on woodwind quintets, brass ensembles, string quartets. Lists pieces by world regions. Lists analytic studies and studies of aesthetics, performance practices, performing groups. 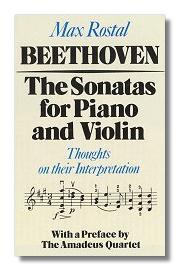 Beethoven: The Sonatas for Piano and Violin. Max Rostal, with a Pianist's Postscript by Günter Ludwig and a History of Performance Practice by Paul Rolland. Toccata Press. 1993. ISBN 0907689051 (hardcover), 090768906X (paperback). In this first full-length study of these works since the beginning of the century, the author provides a guide, both for the performing musician and the general reader, to these great works. Violin and Keyboard: The Duo Repertoire Vol. 1 - From the Seventeenth Century to Mozart, Abraham Loft. Amadeus Press. 1991. ISBN 0931340365 (hardcover). Written for musicians seeking to build or extend their repertoire. Analyses are given of both well-known and many lesser-known pieces, with recommendations on performance approachs as well as descriptions of potential difficulties. Many are suitable for student or amateur musicians. This is mainly a book for violinists - many of the keyboard parts of these pieces are little more than continuo accompaniment. Violin and Keyboard: The Duo Repertoire Vol. 2 - From Beethoven to the Present, Abraham Loft. Amadeus Press. 1991. ISBN 0931340373 (hardcover). Written for musicians seeking to build or extend their repertoire. The second volume, detailing the music of Beethoven onward, contains descriptions of music that puts the keyboardist on more equal footing with the violinist. Violin and Keyboard: The Duo Repertoire Vols. 1 & 2. Abraham Loft. Amadeus Press. 1991. ISBN 0931340381 (hardcover). Intended for performers-amateur, student, or professional-and written in a lively, nontechnical style, this book discusses each piece's points of interest, offering suggestions as to how it is best approached in performance, with many music examples. See descriptions of the individual volumes above. The Beethoven Quartets. Joseph Kerman. W.W. Norton & Company. 1979. ISBN 0393009092 (paperback). 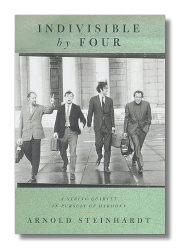 The Beethoven Quartet Companion. Robert Winter, with Robert Martin, Joseph Kerman, Leon Botstein & Michael Steinberg. University of California Press. 1994/1996. ISBN 0520082117 (hardcover), 0520204204 (paperback). While the Beethoven string quartets are to chamber music what the plays of Shakespeare are to drama, even seasoned concertgoers will welcome guidance with these personal and sometimes enigmatic works. 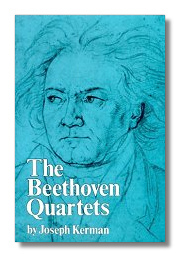 This collection offers Beethoven lovers both detailed notes on the listening experience of each quartet and a stimulating range of more general perspectives: Who has the quartets' audience been? How were the quartets performed before the era of sound recordings? What is the relationship between "classical" and "romantic" in the quartets? How was their reception affected by social and economic history? What sorts of interpretive decisions are made by performers today? 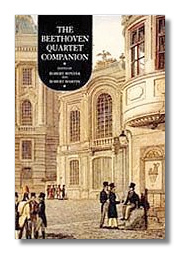 The Companion brings together a matchless group of Beethoven experts. Joseph Kerman is perhaps the world's most renowned Beethoven scholar. Robert Winter, an authority on sketches for the late quartets, has created interactive programs regarded as milestones in multimedia publishing. Maynard Solomon has written an acclaimed biography of Beethoven. Leon Botstein is the conductor of the American Symphony Orchestra as well as a distinguished social historian and college president. Robert Martin writes from his experience as cellist of the Sequoia Quartet. And the book is anchored by the program notes of Michael Steinberg, who has served as Artistic Advisor of the San Francisco Symphony and the Minnesota Orchestra. 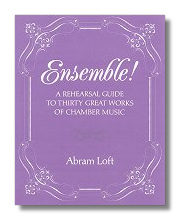 Ensemble: A Rehearsal Guide to Thirty Great Works of Chamber Music. Abraham Loft. Amadeus Press. 1992. ISBN 0931340454 (hardcover). Former Fine Arts Quartet member Abram Loft draws on his vast experience to guide the reader through thirty cornerstones of the chamber music repertoire from Haydn and Mozart to Debussy and Bartók. Indivisible by Four. Arnold Steinhardt. Farrar Straus & Giroux. 1998. ISBN 0374236704 (hardcover), 0374527008 (paperback). A player who studies and performs the exalted string-quartet repertoire has opted for a very special life. Arnold Steinhardt, tracing his own development as a student, orchestra player, and budding young soloist, gives a touching account of how he and his intrepid colleagues were converted to chamber music despite the daunting odds against success. And he reveals as no one has before the intensely difficult process by which – on the battlefield of daily three-hour rehearsals – four individualists master and then overcome the confining demands of ensemble playing. "Would You Care To Say Something?". N Keith Scott. Overleigh Press. 1998. ISBN 0953415600 (hardcover). The thirty year story of a successful music society. A beautifully presented coffee table book with over 240 photographs of the world's leading classical musicians performing over the last 30 years for a music society in the north of England. Full of anecdotes and sanguine advice for all those involved in the business of promoting, performing and listening to live chamber music.